The share of U.S. adults who said nine leading media outlets were credible dropped 5 percentage points since 2016 — including a 12-point drop among Republicans. Republicans are roughly 20 points less likely to say The New York Times and CNN are credible news outlets than they were in late 2016. Attacks on the “fake news” media have been a staple of President Donald Trump’s messaging as both a presidential candidate and commander in chief, but new polling from Morning Consult/The Hollywood Reporter suggests that when it comes to credibility, that rhetoric really only resonates with Republicans. The share of U.S. adults who said nine leading media outlets — including ABC and The Wall Street Journal — were credible has dropped an average of 5 percentage points over the past three years. The small decline was largely driven by Republicans, who became on average 12 points less likely to say those organizations were credible, dropping from 56 percent to 44 percent during that time period. The slide was measured across four Morning Consult surveys conducted annually, starting in December 2016. The New York Times and CNN, two of Trump’s favorite rhetorical punching bags, have suffered the largest drops in credibility among Republicans. In the months following the 2016 presidential election, most members of the Grand Old Party thought the New York Times (52 percent) and CNN (51 percent) had credibility; those figures have since dropped by roughly 20 points, with 32 percent of Republicans now saying each outlet is trustworthy. Republicans’ perceptions of the credibility of MSNBC and The Wall Street Journal have also fallen by double digits: 48 percent to 31 percent and 64 percent to 50 percent, respectively. The public, overall, tends to hold higher views on the credibility of broadcast and newspapers. The latest poll, which has a margin of error of 2 points, was conducted among 2,201 U.S. adults March 28 through April 2, in the middle of the news cycle regarding Attorney General William Barr’s summary of special counsel Robert Mueller’s investigation into Russian meddling in the 2016 presidential election. Trump commonly assails the media at rallies or on Twitter, labeling them as the “enemy of the people” and even going as far as to create the “Fake News Awards.” The Republican National Committee picked up the idea and awarded winners in January 2018. The president has tweeted about “fake news” roughly 400 times since he took office, recently opining about The New York Times’ “Illegal” lack of “legitimate sources” in its Mueller investigation reporting. The only media outlet to lose no credibility among Republicans was Fox News: Seven in 10 said the outlet is credible. Democratic attitudes on the conservative cable channel have not moved either, but the outlet ranks lowest in credibility for that group and among all U.S. adults. 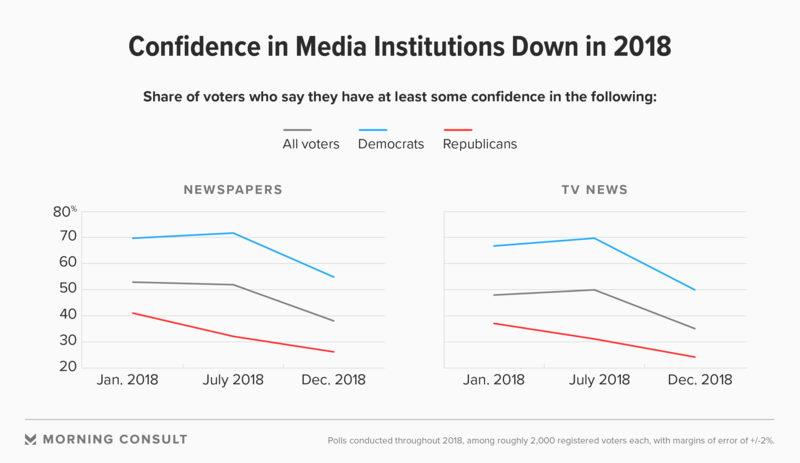 The share of voters who said they had “a lot” or “some” confidence in newspapers dropped 15 points between January and December 2018, from 53 percent to 38 percent, while confidence in television news dropped from 48 percent to 35 percent. 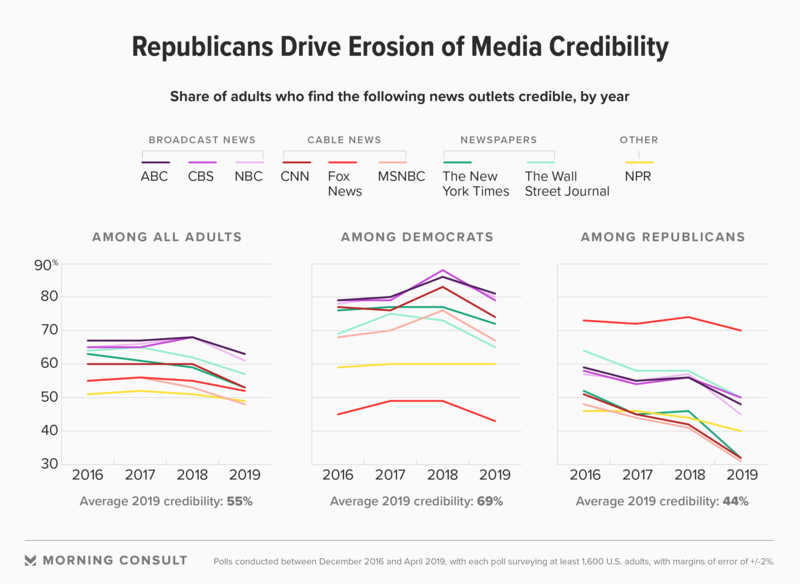 Unlike attitudes on specific outlets, this drop can’t be fully credited to Republicans: Democrats’ confidence in newspapers and TV news also suffered double-digit drops in 2018 — though the group is still twice as likely as Republicans to have at least some confidence in each form of media.